Although they were styilised initially as a classic boy band the Manchester-based quintet who wowed a generation from 1990 onwards were always far more than a customised or manufactured outfit. In Gary Barlow they had – stlll have - a ready made talent, a singer songwriter of genuine ability who would be nobody’s puppet. The addition of Howard Donald, Jason Orange, Mark Owen and Robbie Williams added a fortuitous completeness – here were five lads who could sing, dance and entertain the masses while offering classic teenage pop that filled arenas with screaming fans and shifted dizzying amounts of discs. In time all five members would prove to be expert and commercial pop tunesmiths. The most successful act of their era, Take That have thus far had 27 top 40 singles and 11 number one hits in the UK alone. Internationally the figures are far more impressive: 54 number one singles and 35 number-one albums. Their awards cabinet overflows with BRITS, Ivor Novello Awards and accolades connected to sales and career earnings. They are the most successful boy band in chart history but of course they are no longer just that since their reunion tour of 2006 simply picked up where they’d left off and consequent minor shifts in line-up haven’t diminished their pulling power or their draw as musicians. In a business where tastes change – everything changes - and pop music enjoys rapid shifts of name and fame Take That prove to be made of a far more durable metal than their competition. They are now a respected and admired group who have aged up with skill and grace and at time of writing are just about to unleash their seventh studio disc – 111. The origins of Take That go back to 1990 when the entrepreneur Nigel Martin-Smith sought characters for a British male vocal troupe loosely fashioned as a British answer to New Kids on the Block. But once Gary Barlow appeared Martin-Smith realized he had something even better than a copycat idea – he had a real talent. Once the other boys were in place TV shows were booked and the then fashionable blend of New Jack Swing and urban R&B were worked into a formidable act. Assiduous appearance gigs built a fan base with the relevant age group and after some test-the-water singles bubbled promisingly it fell to their debut album to make the auspicious breakthrough. The cleverly named Take That & Party was a revelation and captured the zeitgeist. It contained a string of hit singles: “It Only Takes a Minute”, “I Found Heaven”, “A Million Love Songs” and a cover of Barry Manilow’s “Could It Be Magic” (smart move since it drew in the mums and daughters) and would stay in the album charts for over a year with 2xPlatinum sales. Look out for it now on the Expanded release. This is where they came in and it’s quite an entrance. If that was Act One, then the follow up was and is a sensation. Everything Changes (1993) stormed the charts and won a Mercury Prize nomination while the stark fact was that this 4xPlatinum masterpiece also holds the record for the number of top 10 singles for a group plucked from one album in the UK. The whole thing was a roaring success from start – “Everything Changes” – to finish - “Babe”. 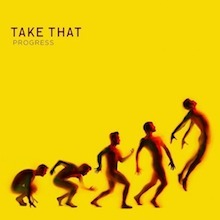 In between the Take That boys could bask in the brilliance of “Pray”, “Relight My Fire”, “Love Ain’t Here Any and “Why Can’t I Wake Up With You”, all written by Barlow with the exception of a cute cover of Dan Hartman’s “Relight…” a choice that put the group in Michael Jackson territory. No point aiming low. Again, check out the Expanded version for extra mixes. And note that like The Beatles before them Take That made significant inroads into the major European markets of Germany, Italy and Holland. The mania was under way. 1995’s Nobody Else was their last before they shocked the world by disbanding for ten years but there was no let-up in quality and class. How could there be when “Sure”, “Never Forget” and the ultimate anthem “Back for Good” were in the can? Adding extra frisson to the control room Take That were joined by Jim Steinman and David Morales while Brothers in Rhythm added a house element that kept Take That on the dance floors at night and in the charts by day. Momentarily gone but never forgotten the Greatest Hits would sell over 5 million copies thanks to the inclusion of everything one could want – from their cover of The Bee Gees “How Deep Is Your Love” to the US version of “Love Ain’t Here Anymore”. Recommending this collection is a no-brainer. It’s an instant party classic. Following Never Forget – The Ultimate Collection Take That reconvened as a four-piece for Beautiful World, minus Robbie Williams who was doing fairly well for himself elsewhere! No matter because the old Barlow magic hadn’t dimmed and they returned to their 1990s sound with a contemporary flair. Mark Owen helms the vocal on “Shine” – a very Manchester sounding piece while Will Malone adds some sparkling arrangements with the London Session Orchestra. The fans hadn’t forgotten and Beautiful World is as big as they get with 9xPlatinum sales and further tip top hits via “Patience”, “I’d Wait For Life” and “Rule the World”. They ruled the airwaves again. By now Take That have taken their original crowd along with them and the parent album for all these goodies is a constant source of delight. The Circus (2008) is another stunning album. We heartily recommend immediate rediscovery for the epic “Greatest Day” alone – pop perfection personified. But it’s all good and doesn’t rely on nostalgia and goodwill to sustain it. Barlow has become a genuine contender in the ballad field and rivals Elton John and the old school singer songwriters for immaculate melodic flair. That is backed up by the kind of reviews Take That get now when even highbrow publications sit up and notice of what they do and report on it favourably and fairly. After the second coming the hallelujahs ring loud for The Greatest Day –Take That Present: The Circus. Their first one of two live albums this captures them live at Wembley Stadium in summer 2009 and also in intimate close-up In Session at Abbey Road. Their last album as a quartet before Robbie Williams' return this is a priceless document. And so to Progress, and the return of the prodigal; Mr. Williams, we’ve been expecting you. They could hardly fail with that news and they didn’t. Recording in New York, Los Angeles, and London and in Peter Gabriel’s Wiltshire facility they came back as if they’d never been away. The singles “The Flood”, “Kidz” and “Happy Now” accompanied a groundswell of interest that is manifest in the huge pre-release orders, the amount of airplay received and the Five Star across the board rave up reviews. Check this out as the double disc Progressed where their noteworthy modernity can be heard to full advantage on tracks like “When We Were Young” (sung by Robbie and Gary) and “Love Love”) vocals shared with Gary and Mark). 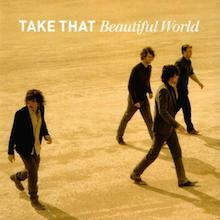 A fully rounded triumph, this disc puts Take That in the limelight again. Progress Live is the perfect and obvious accompaniment, recorded before their natural fan base in London and Manchester in July 2011. Not only does this contain all the big That hits it also finds time for a Williams section where his versions of “Let Me Entertain You”, “Angels” et al signal a true reunification. And so to the immediate present and 111 (2014) - the seventh studio album from Take That in time for Christmas. With production coming from Greg Kurstin (Katy Perry, Kylie Minogue, Lily Allen), John Shanks, Stuart Price and - midst much secrecy Jeff Lynne this must be the most eagerly awaited album of the season. 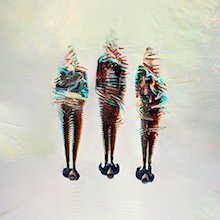 An amalgamation of the last eight years of the band’s sound the new disc takes its title from the line-up, now distilled to Gary Barlow, Mark Owen and Howard Donald. This holy trinity are more than capable of springing further surprises, to judge by the lead-off single “These Days” and the shared credits on “Fall Down At Your Feet: and the exquisite and euphoric “Get Ready For It” which sounds like a future smash. We’ll let you chew it over and make up your own minds. The smart money says Take That are back….for good? Watch this space. It’s just great to have them around again. When Take That disbanded in 1996, they left many young girls in floods of tears. They had arguably been the most popular band in Britain during the early '90s, and many of their fans had never known what it was like to have their favorite band split and move on. Two surprises then occurred, first when Gary Barlow, the main singer and songwriter for the band, failed to set the charts alight with his solo projects. Despite hitting number one with two singles ("Forever Love" and "Love Won't Wait") and the accompanying album Open Road, Barlow's solo career was seen as a disappointment and he quickly faded from the affections of young girls who either grew up or turned their attention to Boyzone or Westlife. The second surprise occurred when the cheekiest former member of the band, Robbie Williams, whom many had seen as precipitating the breakup in the first place, went on to become one of the biggest solo stars of the late '90s and early 2000s with eight number one albums. In fact, he was so big that when the other four invited him to rejoin them for a reunion world tour, he said no, intending to remain solo and promote his recently released album, Rudebox. So Take That re-formed, went on the road without Williams, and recorded a new album without him, too. Doomed to failure? Not a bit, for the album Beautiful World was filled with great new contemporary songs, virtually all written by the bandmembers, who had grown up and matured in the intervening years. 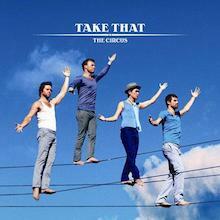 There was a sense of professionalism surrounding the whole project (produced by John Shanks) and imbuing every song, whether a ballad like "I'd Wait for Life" or "What You Believe In" (on which Mark Owen took vocal lead), or an uptempo track like "Reach Out" or "Shine," the latter of which was a masterpiece of 21st century pop. The bandmembers shared responsibilities for singing on the album, and they were obviously enjoying every minute of the comeback, although Barlow was still very much in charge, taking lead vocal duties on six of the tracks. The lead single was "Patience," a classic pop song and midtempo ballad with a killer hook down the scales for a chorus, and the second single, "Shine," was completely different, sort of a cross between Queen at their most camp and the Scissor Sisters. The final track, "Wooden Boat," was another totally different song, sung by Jason Orange to an acoustic background, and one minute after it had finished, another Gary Barlow power ballad, "Butterfly," faded in as a bonus track on some editions of the album. Robbie Williams was slated for his solo offering Rudebox, but his former bandmates celebrated one of the greatest comebacks of all time, hitting number one throughout December and even returning to the top in the spring of 2007 when the second single, "Shine," kicked in and hit the Top Five for several more weeks, over a year after the album had been released. So is there hope for any band attempting a comeback after ten years? If the band's album is this good, you bet there is. This is the true Take That comeback, the one where Robbie Williams returns to the fold for the first time since 1995. When he split at the height of Brit-pop, conventional wisdom suggested that Gary Barlow would wind up as the runaway solo star from the British boy band, but things didn’t turn out that way. Robbie wound up as a superstar, the rest of the band reuniting without him in 2006, then admirably settling into an unthreatening adult contemporary groove on 2008’s Circus. Robbie’s return throws all that complacency out the window, with the band opting to follow the cool club and cocktail inflections of his recent work. It’s the right move, of course -- Take That was stuck in the middle of the road, and no matter how pleasant that path was, it was bound to provide diminishing returns commercially -- but the surprise is how effective the Williams-ization of Take That is on Progress. The rest of the band gamely follows his lead, meshing vocally as they used to, but the emphasis is not on harmonies, it’s on groove and texture, ballads taking a backseat to clever rips on Gorillaz or synthesized glam stomps. 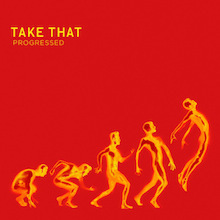 Things start to slow down toward the end of Progress, when Mark Owen, Howard Donald, Jason Orange, and Barlow get their own track to write -- each revert to type, Barlow stultifyingly so on the sticky “Eight Letters” -- but for seven tracks, Progress is the hippest and best music Take That has ever made. A Take That reunion was perhaps as inevitable as the fact that Robbie Williams would decide to opt out of the proceedings. He inexplicably became the biggest star out of the franchise, in no way needing the support group the rest craved after their solo projects imploded. And there is something to be said for brand names: even if it didn’t jump-start the phenomenon, the 2006 reunion Beautiful World returned Take That to the upper reaches of the charts, and their 2008 follow-up, The Circus, builds upon its template, offering more of the same without quite seeming like pandering. Fittingly for a foursome facing 40, dance-pop has been banished in favor of well-manicured maturity, culled chiefly from Coldplay, whose tasteful, chilly surfaces blend easily with Gary Barlow’s Elton John and George Michael aspirations. Barlow is also responsible for the gentle Sgt. Pepper's pastiche of the title track, but the one responsible for giving The Circus a bit of a beat is Mark Owen, whose contributions, particularly the cheerfully respectful stomp “Up All Night,” are a welcome break from the album’s steady, stately march. The Circus is the work of a group where the sum is greater than the parts, and Take That have wound up with an adult pop album that is somewhat comforting. Robbie Williams once again left Take That in 2014 and, not long afterward, so did Jason Orange, leaving the group as the trio of Gary Barlow, Mark Owen, and Howard Donald. Hence the title of 2014's album, III: this is not the group's third record, nor does it herald a new phase (à la Van Halen III), but it's simply an album made by the three men of Take That. III wasn't intended as a trio album -- Orange left during the recording, leaving the three survivors to split his parts -- and, honestly, it doesn't feel that much different than the Take That albums released prior to Progress, when the former boy band returned as a quartet of men. Wisely, Take That retain a shade of the stylish sensibilities of Progress -- "These Days," the opening track and lead single, is nimble with its chicken-scratch guitar and distilled disco -- but those aren't the focus of the record; they're accents to what's essentially a very well-done adult pop album. Compared to some of Barlow's past solo projects, III is livelier -- even when it slides into a series of ballads it manages to not quite be staid -- due to these lite disco cuts ("Give You My Love" feels like a de facto Bee Gees tribute) and savvy electronic arrangements. The key to III's success is that Take That don't push these electronic elements too hard; they're there not to bring in a younger audience, but to show that the group knows it's 2014, not 1994, so it winds up feeling reflective and tasteful, a record that feels more realized than any latter-day Robbie-less Take That album. Riding high on their comeback success, Take That did a two-month tour in summer 2009 that set a new record for the fastest-selling tour in U.K. history. 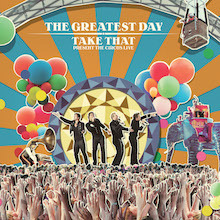 The Greatest Day: The Circus Live documents the final stop on the tour, a massive show for over 80,000 fans at Wembley Stadium in London on July 5, 2009. This was the second tour by Take That since reuniting in 2006 without Robbie Williams. Take That had broken up ten years earlier in 1996 after taking over the English pop world with Take That & Party (1992), Everything Changes (1993), and Nobody Else (1995), a trio of multi-platinum albums filled with smash hits. While all five bandmembers pursued different solo opportunities in the wake of their 1996 split, Williams was the only one to make it as a star on his own, and when the reunion came around ten years later, he declined to participate. The other four bandmembers, Gary Barlow, Howard Donald, Jason Orange, and Mark Owen, got back together nonetheless, recorded the comeback album Beautiful World (2006), and mounted a concert tour with Sugababes as their opening act. Their comeback proved so successful, Take That went about recording another album, The Circus, and planning another tour. The Greatest Day: The Circus Live finds the band on a roll, playing its final date after performing sold-out shows across England, Scotland, and Wales. They sing all the hits from Beautiful World ("Patience," "Shine," "I'd Wait for Life") and The Circus ("Greatest Day," "Up All Night," "Said It All"). There are nine songs overall from The Circus, whose "Hold Up a Light" is performed during the finale along with the 2007 chart-topper "Rule the World." The older hits are few and far between with just a couple songs each from Everything Changes ("Pray," "Relight My Fire") and Nobody Else ("Back for Good," "Never Forget"). In addition to the Wembley show, there's an 11-track live-in-the-studio session at Abbey Road that includes many of the same songs in a more controlled context. While there was understandable skepticism over how Robbie Williams' supersize ego would fit in with his altogether more team-oriented Take That bandmates, the recently reunited quintet's second release in six months, Progressed, suggests that Barlow and co. should do everything they can to hang onto their live-wire new recruit. The eight-track addition to the U.K.'s fastest-selling record of the 21st century, Progress, released to coincide with their record-breaking stadium tour, may not contain any "Greatest Day" or "Patience"-style lighters-in-the-air anthems, but Williams' continued presence yet again appears to have instilled a newfound sense of invention which was sorely lacking from their hugely successful but occasionally bland first two comeback records. The gently strummed nostalgia of opener "When We Were Young," a Mumford and Sons-ish slice of acoustic folk which deals with the disillusionment of ageing, suggests the band has disappointingly gone back to basics, but it's something of a red herring, as the rest of the EP continues to develop the electro sound they bravely pursued on its parent album. Lead single, and X-Men: First Class soundtrack number "Love Love" (the second track they've provided for a Matthew Vaughn-directed film) couldn't be more different from Stardust's "Rule the World," its swaggering synths and ominous, pounding beats recalling '80s Depeche Mode at their finest, "Aliens" is a wildly ambitious, mini-rock opera, featuring a War of the Worlds-referencing intro, a theatrical chorus, and some hypnotic rhythms which owe more than a nod to Michael Jackson's "Beat It," while "Beautiful" starts off with a lilting, ABBA-style piano intro before merging into a strident piece of new wave synth pop, reminiscent of producer Stuart Price's work with the Killers. For those slightly disoriented by the post-apocalyptic dubstep of "Man" and the clattering, doom-laden "The Day the Work Is Done," there are a few more gentler affairs, such as the Pet Shop Boys-esque tear jerker "Don't Say Goodbye," and the wistful, Vangelis-inspired closing ballad, "Wonderful World," the latter of which sees Jason Orange take a rare lead vocal, but even they avoid drifting into their usual MOR territory. While many deluxe reissues do nothing more than cobble together a few outtakes that weren't good enough to be on the original album in the first place, Progressed stands alone on its own merits, and is arguably the better record of the two. After scaling the heights of 2009's jaw-dropping The Circus tour, which included everything from hot air balloons to live elephants, it looked as though Take That had left themselves with nowhere else to go when it came to the live stage. However, two years on and with the missing piece of the jigsaw temporarily back in place, the man band somehow managed to surpass itself again. 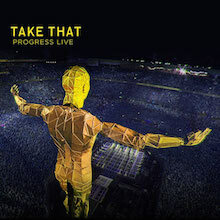 Progress Live, an audio souvenir of "the biggest British stadium tour of all time" may be missing the spectacular visual elements (a 60-foot mechanical robot, stunning pyrotechnics) that wowed the near two million fans across 35 dates, but the return of Robbie Williams ensures that the music was always going to be its most intriguing aspect. Recorded at the City of Manchester and Wembley stadiums, the anticipation at seeing all five members together for the first time since 1995 is palpable from the get-go, but fans have to wait until the more familiar recent lineup has run through four of its stadium-ready pop/rock anthems ("Patience," "Rule the World") before the cheeky chappie makes his entrance. Rather disappointingly, he does so on five of his own solo tracks, including signature tunes "Angels" and "Rock DJ" and a rather random outing for "Come Undone," suggesting the ego that perhaps split the reaction to the reunion right down the middle is very much intact. However, once his routine showman schtick is over, it's hard not to be charmed by the group's audible joy at performing as a quintet again, as Take That reel through eight numbers from 2010's electro-focused Progress, most of which hold up surprisingly well in such a grand setting, and four classic '90s singles, including an inspired moment when Robbie's "No Regrets" (his bitter take on his previous experiences in the band) segues into their uplifting cover of "Relight My Fire." With a set list surprisingly less nostalgic than their previous tours, Progress Live may not satisfy those who feel they were at their best in their original incarnation. But for fans of Take That in whatever form they take, it's an undeniably impressive show that, this time round, will surely be impossible to top.